Growing lettuce indoors allows you to reap a huge variety of fresh, crispy homegrown lettuce year-round. Here you'll discover the best types of lettuce to grow indoors, how to grow lettuce under lights, how much to water, when to fertilize and more. One of the most popular vegetables, the abundance of lettuce varieties available is staggering. Four basic types of lettuce are butterhead, crisphead, cos or romaine (upright) and loose-leaf. Which lettuce variety grows well indoors? Among all the lettuce types, loose-leaf lettuce is easiest to grow and will provide a steady supply of leaves to harvest. Some upright varieties stay small. 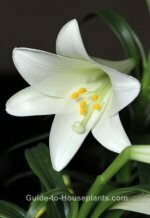 Look for baby or little in the name to ensure a small type suitable for growing indoors. Baby leaf lettuce varieties tend to be the most tender anyway. 'Little Gem' is a popular upright variety. Some good loose-leaf varieties include 'Oak Leaf' and 'Salad Bowl'. Because lettuce is a short-season crop, you can get an ongoing harvest by making small, succession plantings. Baby-sized lettuce reaches maturity in about 4-6 weeks. Sow lettuce seeds every couple weeks to stretch out the harvest season. How to sow lettuce seed: Drop a small amount of lettuce seeds into one hand, then pinch the seed between your forefinger and thumb of the other hand. Drop the seeds thinly over the soil. Lettuce seeds are tiny, and they need light to germinate, so cover the seeds lightly -- never more than 1/4-in (.5 cm) -- with potting medium. Then spray with water until thoroughly moist. Mist every morning to keep the medium moist at all times. Seeds will germinate in 7-14 days, depending on the type. What temperature? Lettuce bolts (goes to seed) quickly in hot weather, but because you're growing lettuce indoors, you do have control. Cool to average room temperatures of 60-70°F/16-21°C, with a 10°F/6°C drop at night, will keep seedlings growing steadily. Don't use a heating mat for the seedlings. They like it cool. How much light is enough? Seedlings need more intense light than mature plants. If seedlings don't get enough strong light, they'll become spindly. Give them at least 6 hours in front of a sunny window. Turn pots or trays as necessary to prevent seedlings from leaning toward the light. A sunporch can be ideal, providing more sun exposure as well as the cooler temperatures ideal for cold-loving lettuce. Don't have a sunny window? Grow lights raise good seedlings. Keep light fixture close -- no more than 4 in (10 cm) above the seedlings -- and leave it on for 14 hours a day. 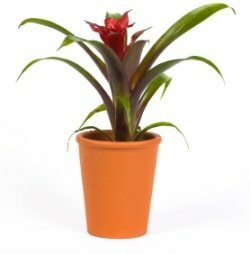 Turn it off at night because plants won't thrive in continuous light. The light garden shown here, provides full-spectrum light, while using 45% less energy than standard fluorescent bulbs. Keep soil moist. Lettuce is made up of 90% water and has shallow roots, so water as often as needed to keep the soil evenly moist, but not soggy. When growing lettuce indoors, in a warm, dry house, they may need watered every couple days. For seedlings, it's best to water from the bottom, using a watering tray. This helps to prevent fungal diseases such as damping off. Use tepid water rather than cold water. Thin seedlings when they grow their "true" (second set of) leaves. Pull out seedlings to allow 3 in (7.5 cm) between plants to give them room to grow. You don't have to waste them. Transplant them in separate containers. Or wash them and toss in salads. Lettuce seedlings are edible, delicious and chock-full of vitamins A and C.
When and How to Fertilize. You'll get an abundance of leaf growth by giving seedlings a light feeding. Start fertilizing after the first true leaves appear (they are the second pair of leaves that develop). Use a fertilizer solution at half-strength, once a week for three weeks. Fish emulsion or other organic fertilizer is good for growing lettuce indoors. Avoid getting any fertilizer on the leaves. Loose-leaf and romaine can be harvested anytime the plants are big enough to use. Pick the outer leaves first, allowing the inner leaves to grow. Watch your crop closely because mature lettuce plants go to seed quickly and become bitter-tasting. Wash and store the cool way. The best way to wash lettuce is to fill a large bowl with cold water and submerse the leaves. Shake the leaves dry, then wrap them in dry paper towels before refrigerating. Lettuce will stay fresh for a couple weeks.